In a village where charming inns are the norm, none matches the whimsicality of Carmel’s Vendange Inn & Suites. Playing on the meaning of its name (Vendange = French for ‘annual grape harvest’) 15 of Vendange’s 20 quaint rooms are sponsored by local wineries, each of which has designed and provided the wine-themed décor for its namesake guest quarters. 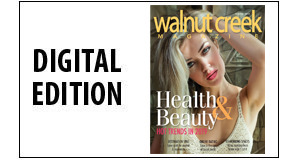 A stroll around the lush property – located on the quieter western side of the Village - and a glance at the monikers that adorn each guest room door provide a rudimentary introduction to the central coast’s wine bounty. You’ll spy these participating wineries: Blair, Cima Collina, Dawn’s Dream, Galante, Holman Ranch, J. Lohr, Joullian, Manzoni, McIntyre, Mesa Del Sol, Otter Cove, Tudor, Twisted Roots, and Ventana. Guests will find a bottle (for purchase) of their room’s namesake wine awaiting them. Mesa Del Sol’s owner and winemaker Ann Hougham personally decorated the room bearing her winery’s name. Utilizing a country vineyard theme, she selected muted floral print shams, color photographs of Arroyo Seco gorge and the Mesa Del Sol vineyards, a ladder-back wooden chair, an antique, pine-trimmed mirror, and wine paintings. The Holman Ranch room features prints of their wines and olive oils, and the ranch property at sunset. 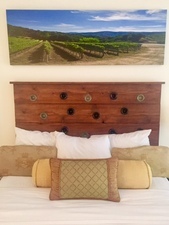 A unique wine bottle headboard is the focal point of The Cima Collina room. Original wire art adorns the walls. In the Twisted Roots suite, an antiqued wood panel wine bottle holder cradles varied vintages, and a canvas print of the 1918-planted Dairy vineyard zinfandel vine finds its focal point over the fireplace. J. Lohr has placed a wine barrel on its cozy balcony. Whatever the wine theme, each Vendange room boasts sleek, modern bathrooms with imported Spanish marble. Sleeping areas have memory foam-top beds, deluxe linens, and high-definition flat-screen televisions. The separate Cottage Suite offers 650-square-feet of space, with a California king bed, 50-inch HD television, and a kitchenette, and is the perfect place for a honeymoon or romantic getaway. A breakfast buffet is included with each stay: coffee, juices, yogurt, pastries from Monterey’s famed Paris Bakery, quiche, and cereals. 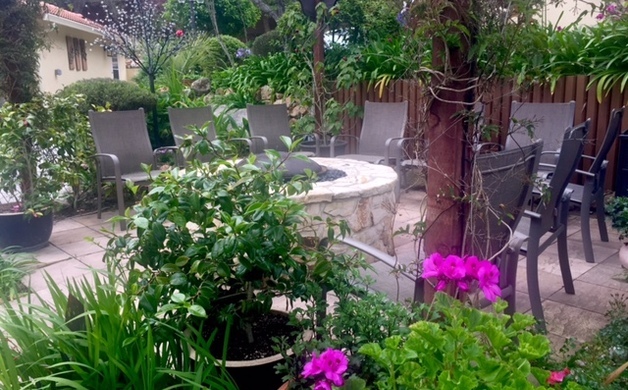 Enjoy in the lobby, take back to your room, or dine al fresco in the beautifully maintained gardens. 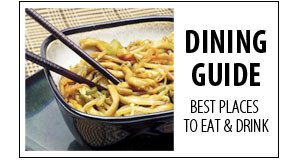 Complimentary wine and appetizers are served on Friday and Saturday evenings. Vendange also provides free Wi-Fi and free parking. Minutes from downtown Carmel’s boutiques, galleries, restaurants, and wine tasting rooms, and just a few miles from Carmel Valley Village, where you’ll find the official tasting rooms of many of the hotel’s wine sponsors, Vendange provides a peaceful and affordable respite at which to unwind. The friendly staff is ready and able to recommend any number of area activities to help you plan your stay. Consider an outing to historic Pacific Grove and its picturesque Lover's Point Park. Dine at the iconic Beach House Restaurant in its newly remodeled Solarium - a popular outdoor patio that shields from sun and fog. 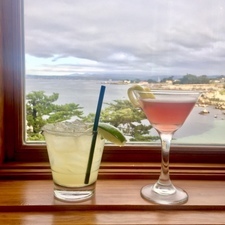 Every table at the Beach House affords a view of beautiful Monterey Bay. Enjoy creative cocktails and hearty California cuisine in a festive atmosphere. Before or after your meal, walk Pacific Grove's charming streets and take notice of the green plaques on many of the older homes. Each lists the home's first owner and year the home was built. With so much to do and see in the area, you'll likely return again and again. Locate your favorite wine-themed room at Vendange and make it your Carmel go-to spot. 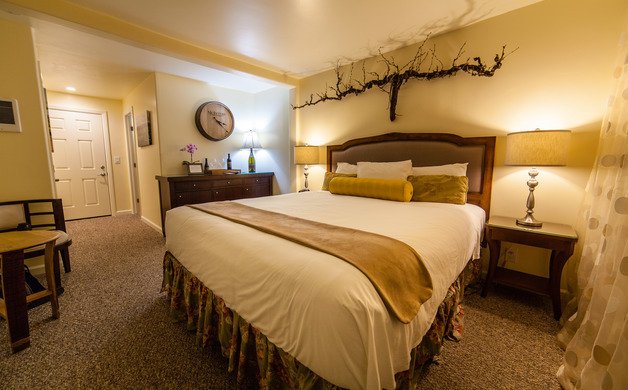 Or cycle through each room and suite in order to experience the varied hospitality of Monterey County’s wine region. It's all right here, in this one charming inn.